President of the Senate, Dr. Abubakar Bukola Saraki, has welcomed President Muhammadu Buhari back to Nigeria. 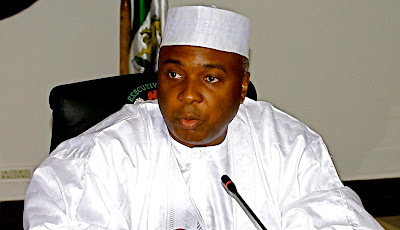 In a statement signed by his Special Adviser on Media and Publicity, Yusuph Olaniyonu, Saraki thanked God for the safe return and recovery of the President, and reaffirmed the commitment of the National Assembly to continue working alongside the President in achieving objectives aimed at improving the standard of living of Nigerians and overall development of the country. “I thank Almighty Allah for bringing President Muhammadu Buhari back whole, hale and hearty,” the Senate President said, “When we met just two days ago, it was clear that Mr. President would soon be coming back home. In this regard, on behalf of all the Senators, I welcome him back to the country. “We must also commend Professor Yemi Osinbajo, our Vice President, who, as Acting President, held the forte in Mr. President’s absence. “Now that President Buhari has returned home, both branches of government, the executive and the legislature, must continue to sync our policy and legislative objectives to strengthen our economy through the diversification of our revenue streams; creating opportunities for more private sector participation in the economy; and creating access to capital for MSMEs and would-be entrepreneurs. We must also tackle the unemployment problem head-on. We can only do this, working together. “Moving forward, over the next few weeks, I am sure I speak on behalf of all the Senators when I say that we look forward to considering the Virement request by the Presidency which is before the National Assembly, and working towards the early presentation, consideration and passage of the 2018 budget. “May the Almighty Allah continue to bless our nation, and give our President, Muhammadu Buhari, the strength and wisdom to lead us successfully ” the Senate President said.